Vinification & Aging: Grapes are crushed by feel and a small amount of stems are left on. Twenty percent of the grapes are slightly dried to add complexity. 50% of the wine was fermented in stainless steel and 50% was fermented in medium toasted barrels for 8 days. Maceration took place over a 30-day period. The wine was, then, transferred to medium toasted barrels where it completed its malolactic fermentation. 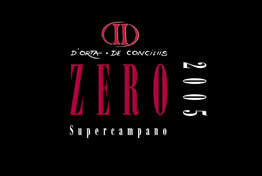 Zero is aged for 16 months in barrels and 6 months in bottle prior to release. Description: Aromas of plums, blackberries, cherries and hazelnut. On the palate full bodied, powerful structure wine that leaves a long velvety finish. Food Pairing: Roasted duck and steaks.